Target exactly the music you want on Internet radio and record it in MP3 format. Enjoy any radio station or podcast. All the hits, all the stars, every music genre and every radio station. Your music—free, legal and fast! 80 genres, every artist, millions of songs and every radio station in the world are all just a mouse click away. 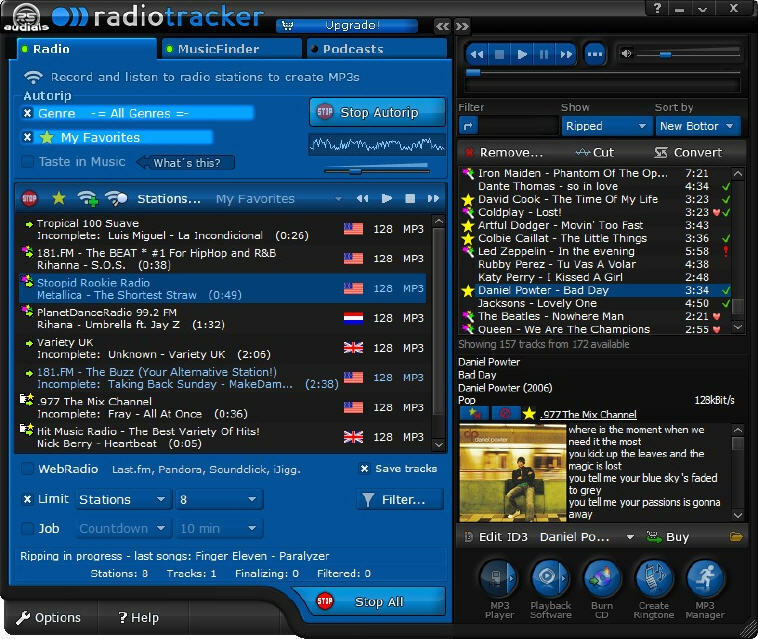 Audials Radiotracker’s groundbreaking technology automatically downloads your songs in less than a minute, making it the most popular, the most decorated and the absolute best-selling web radio software in online and retail outlets in the process. No subscription, no hidden fees, just music edited perfectly in music shop quality and, due to free and legal real-time recordings of Internet radio stations, there’s no copy protection!! The world’s top-selling software for targeted recordings from web radio stations! Audio studio permits recutting and fading. Helps you find and play virtually anything within seconds. is a real audio stream ripper software utility to rip music from online radio station. All-in-one set of audio production tools, Record, mix, rip and burn, make ringtones. is the most advanced and complete music editor software for creative DJs available in its price range.